The Absco Premier Garden Shed is designed for maximum strength and manufactured from low maintenance ribbed steel sheeting. 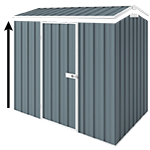 Absco Premier products are our best selling garden sheds. Our Premier Shed range is designed for maximum strength and manufactured from low maintenance ribbed steel sheeting for added security. This 2.26m x 2.26m x 2m single door Zincalume shed is very popular as it comfortably fits into most suburban backyards and has a very attractive price tag. For permanent secure installation of your shed it is recommended to use anchors. To secure the walls to your concrete slab you will need 12 anchors for this shed.